I am the Network Engineer at a local health care company here in Buffalo, NY. I was previously the Network Engineer and IT Director at another health care company for seven years before moving on to another adventure. 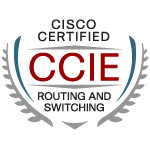 I have been working with Cisco for the last eight years and decided it was time to punish myself and pursue my CCIE. Hopefully along the way I can post about my trials.